Courtesy of the Bibendum Burgundy tasting 2007. This is more like it! Eighty-five year old vines growing on limestone soil produce a classic Pouilly-Fuissé. Honeysuckle, tangerine, apricot. This wine is ripe and rich with honey flavours interspersed with dots of Indian Ocean spices. Aged in 50 per cent new oak and 50 per cent 1 year old oak. 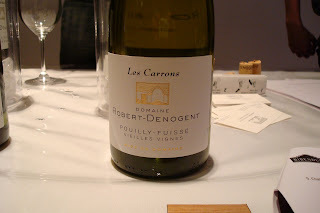 Excellent wine to be compared with a Corton-Charlemagne in a blind tasting.